The Insatiable Critic: Critic BOOK Special: SNL vet Jim Breuer comes clean in "I'm Not High"
Critic BOOK Special: SNL vet Jim Breuer comes clean in "I'm Not High"
Jim Breuer is known for a lot of things: Joe Pesci, Goat Boy, that stoner guy in the movie Half-Baked. 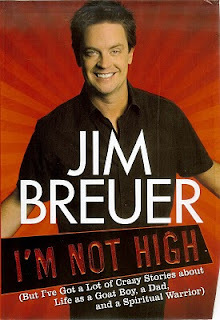 I was ready for a lot of silly comedy in his latest book, "I'm Not High". What I wasn't ready for was the deep spirituality that resides in the man and comes through in the pages. This is by far one of the most compelling memoirs I've read lately - I simply could not put it down. Breuer writes with a kind of raw honesty that makes you want to cry and laugh all at the same time. Being a writer, there is nothing more frustrating to me than a memoir that is poorly written, or spends a lot of time trashing other people, or worse yet, is begging the reader to be uber-sympathetic to him or her for all their foibles and mishaps. Breuer comes completely clean in his book. He's really not high, although he's been high in the past, multiple times, and certainly LOOKS high. But he's also just a really decent guy who uses laughter as a tool for healing. This book is a lot of things. A collection of funny stories, a case for the power of prayer, a confessional, a diary. It's definitely never boring. Breuer takes us through the highs and lows of his childhood, the long road of breaking into fame and all the heartbreaking disappointments and temptations that come with it. But the message Breuer comes through with time and time again is to never lose yourself in success. Never think you are invincible, or that fame and fortune can replace love and family. What is most impressive about Breuer's book is how he can talk about his faith in God so freely and not make the reader uncomfortable or make himself sound like some sort of evangelist. It's clear the writing comes from the heart, and that's what makes Breuer so likeable, even when some of his experiences could be speculated to have just been coincidence rather than divine intervention. This book made me think a lot about my own life and what I should be grateful for. I would like to mention that seeing Breuer live in New Haven earlier this month is an experience I will never forget. The man is freakin' hilarious. Even the way he laughs is hilarious - I always thought it was just part of his characters but that's actually just the way he is. And having heard him tell some of the tales in the book live, while doing voices people such as Dave Chappelle, it made the book all the more enjoyable because I could hear his impressions in my head as I read through the chapters. And honest to God, he's just a great guy. After his stand-up routine, we all lined up to have a copy of our book signed. When I came to him, I told him how much I had loved him on Saturday Night Live back in the 90s. He said to me, "Wow, that really means a lot to me. Also, I saw you laughing so hard in the second row there. I'm glad you were really enjoying yourself." And I could tell by the look on his face that he really meant it. If you are looking for straight-up, honest and funny writing, look no further than "I'm Not High." Come for the humor, but stay for the heart. For more about Jim and his upcoming tour dates, click here.